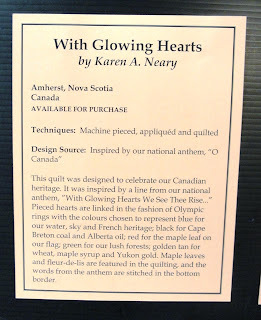 I have a blog pal Karen of Sew Karen-ly Created who mentioned that she was going to have a quilt hanging in IQF - Long Beach this year. 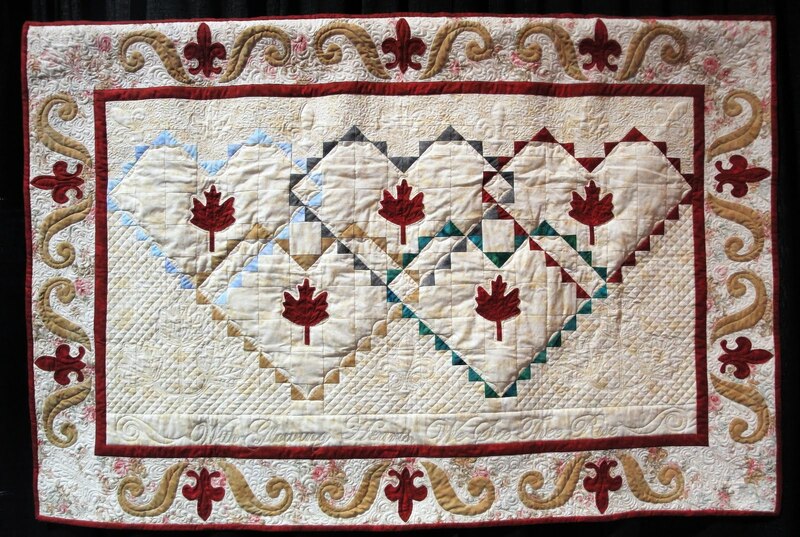 Being Canadian, her quilt would hang in the O'Canada section. I volunteered to white glove and guess where they put me? Right. 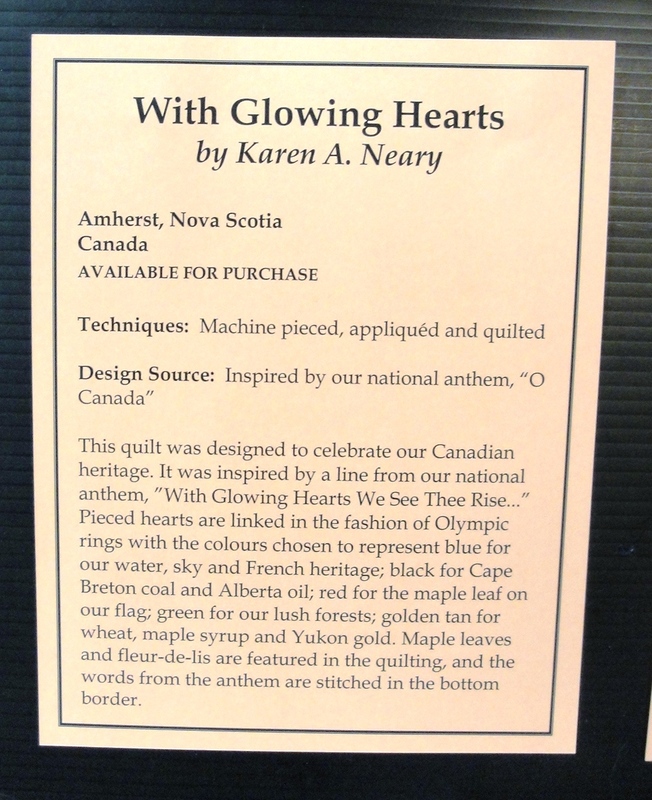 In the O'Canada section. I know, kismet for sure. 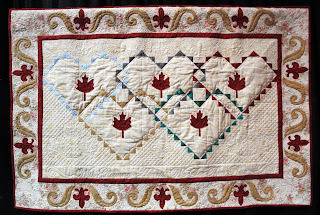 Stop by tomorrow for a few more of my favorite quilts from the show. 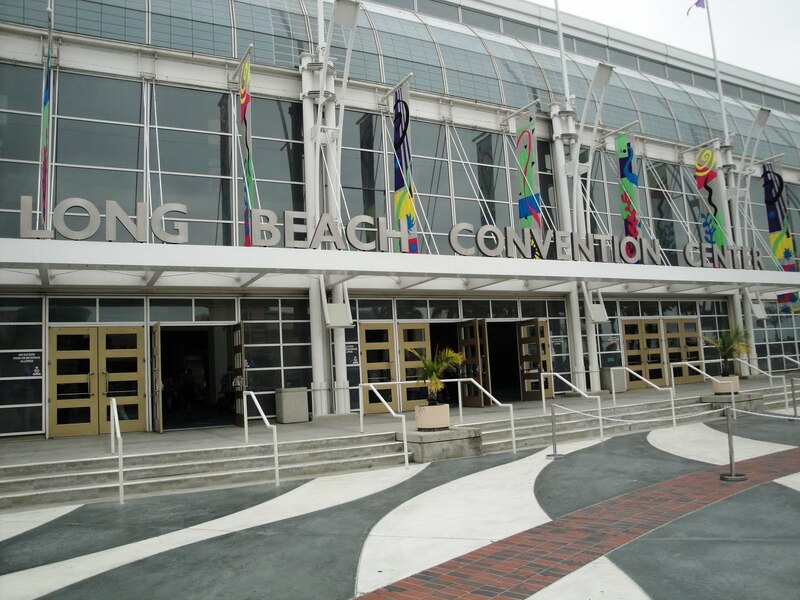 Yesterday was the first day of IQF in Long Beach. They had a preview night on Thursday; but, officially Friday was the first full day. 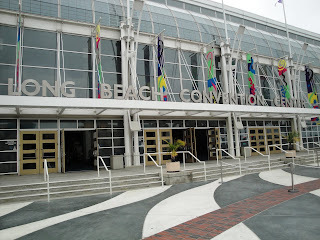 It is a great show and so much fun to run into so many quilting friends. Yesterday was a volunteer day. I was one of the white glove ladies; you know, the ones who remind you NOT to photograph certain quilts, and NOT to touch the quilts. 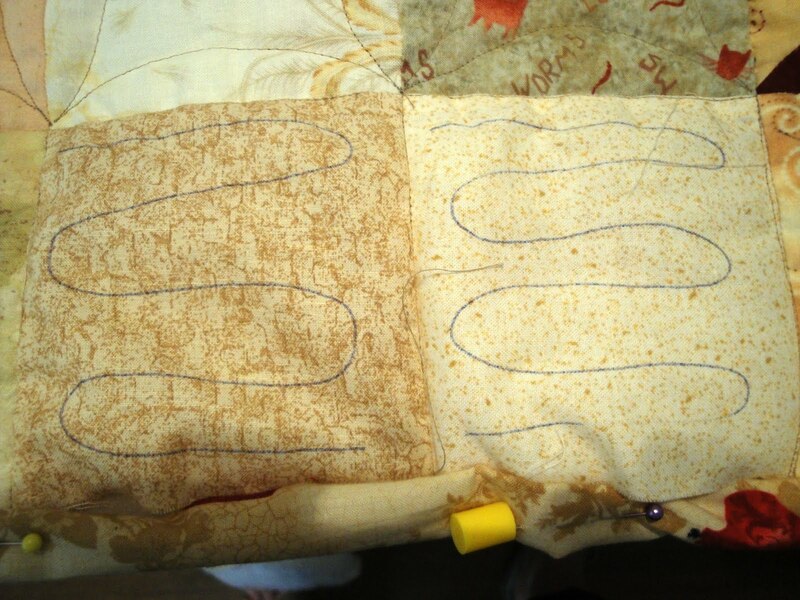 We can flip a quilt over to show the back with our white glove. I was stationed in O'Canada section. More on that later. Here are a few pictures I got before actually getting inside the show. Downtown Long Beach before the marine layer burned off. 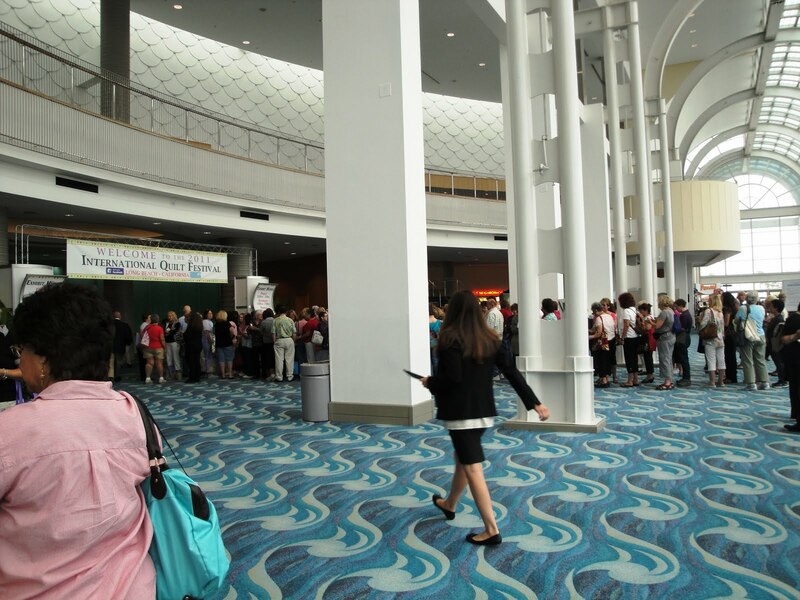 Quilters lining up to get in the show. I'm going again today; this time to play. 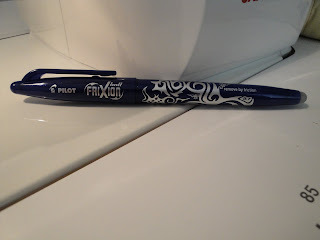 I know most of you have seen this new pen; but, just in case. . . .
Just mark away what you want on your quilt. 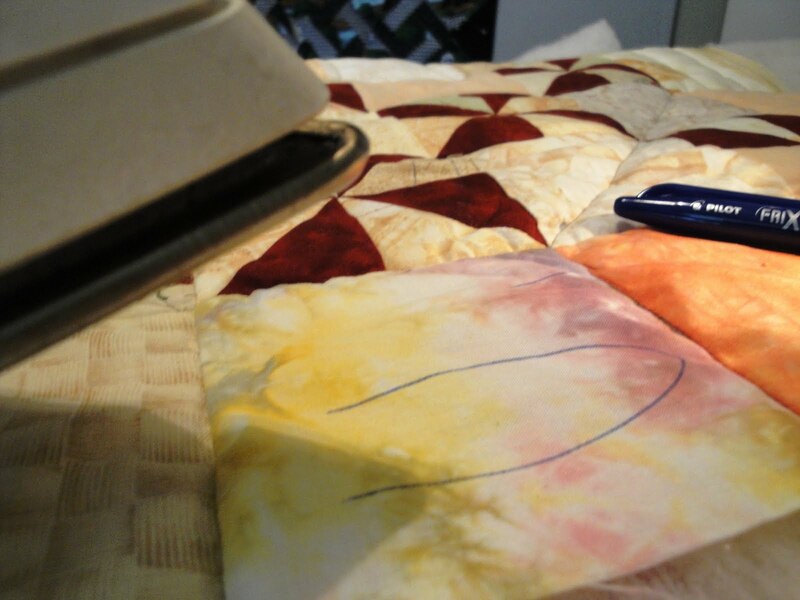 In this case, I can't make up my mind how to quilt the border. 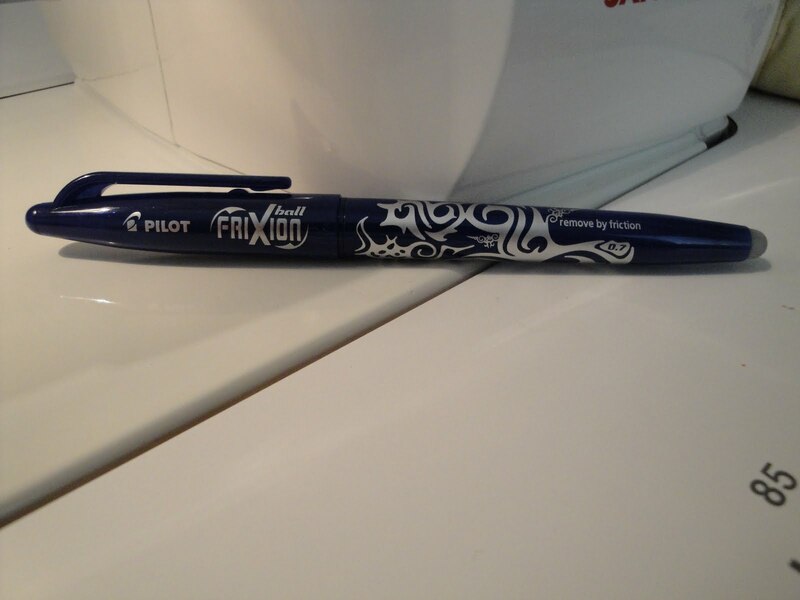 To remove the ink . . . . I've been absent for a while. My excuse is: I've had company since Friday and I've been playing. I always have fun when my family is here and this time was no exception. But, today they all flew home. Richard at 7:30 AM and Janet and Robert at 3:00 PM. But, guess what I started. Right. I spent an hour manhandling Big Red. 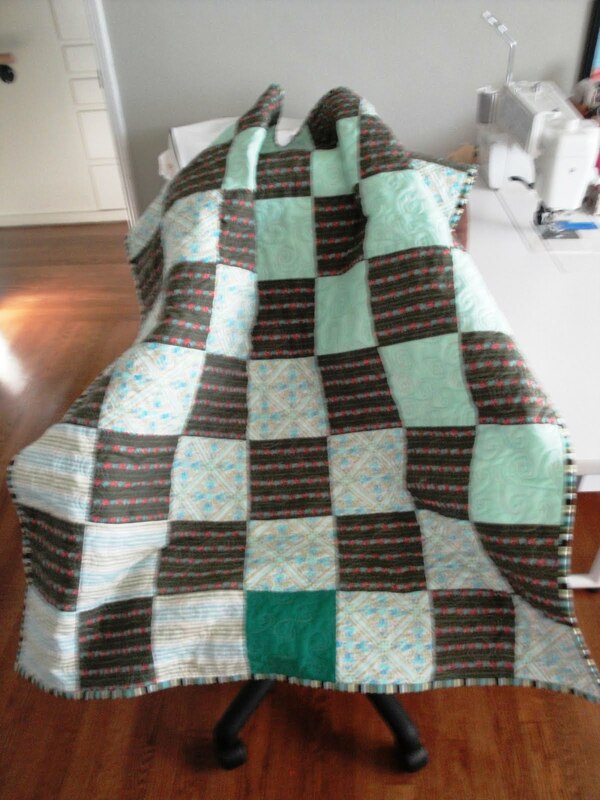 The first quilt on the pile is now done. I decided to start on the small one to get the mojo working. 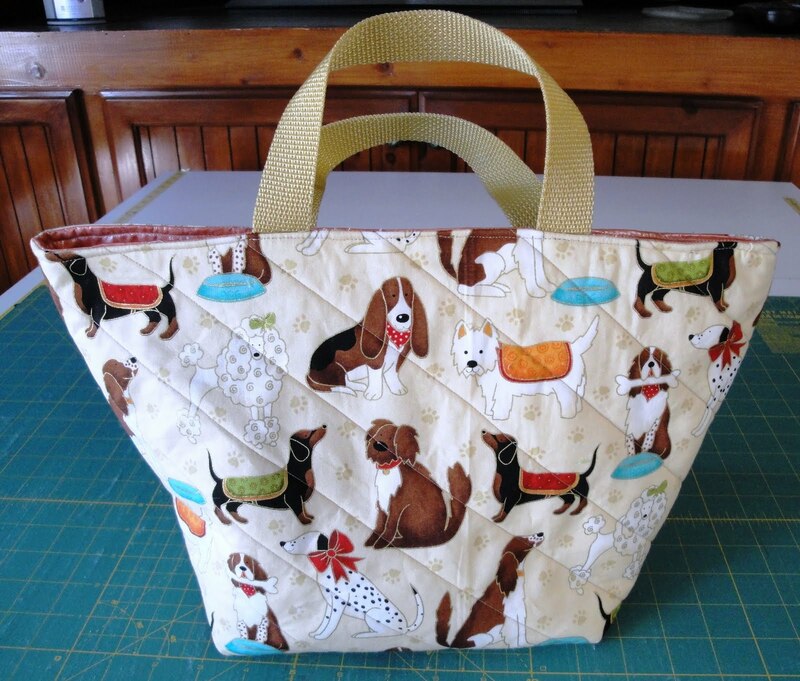 It was a kit that was put together by our Community Service group at our guild, Quilters by the Sea. It should make some young child smile. I really need to get to the largest one. That's the one due for my UFO challenge in August. So, tomorrow I start man handling the monster. 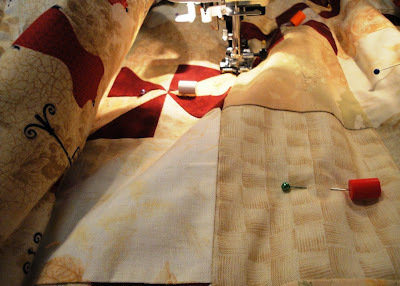 I spent today making backings and layering quilts. Well, three of these I did today. That means I'm going to quilt till I wilt next week, and probably beyond. 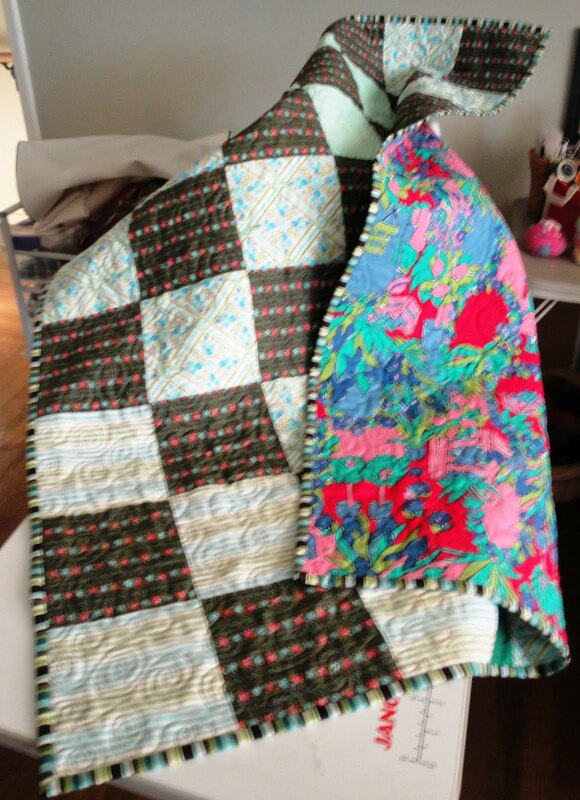 I'm sure most of you have heard about the Jelly Roll Race Quilt, AKA 1600 Quilt (you can see it here). I added a border and that extra-wide rick rack. The green in the corners is because I ran out of the pink. I think that is called a design opportunity. It's named Sunkissed Jelly and is for my 18-year old granddaughter, Rachel, who will be visiting me next month for a week. 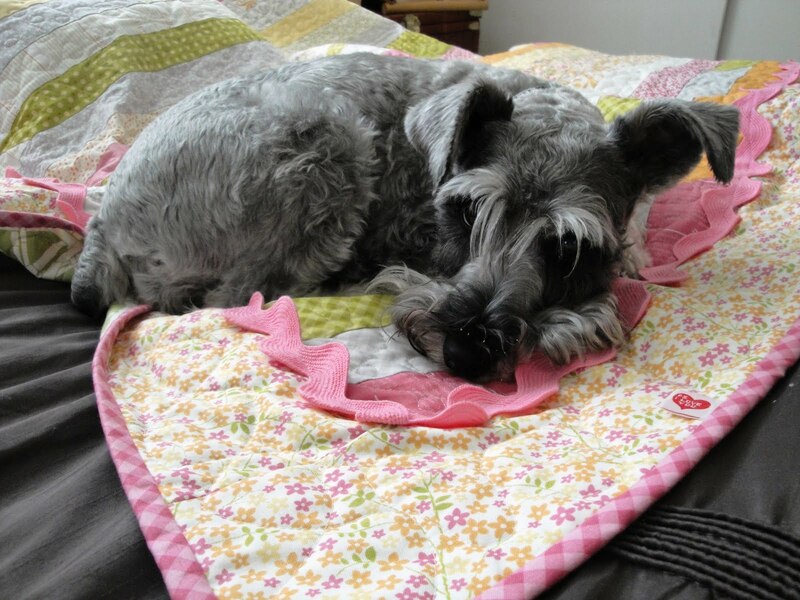 I think it is a very girly quilt, don't you? She's pretty girly. You just knew that dog had to test it didn't you? 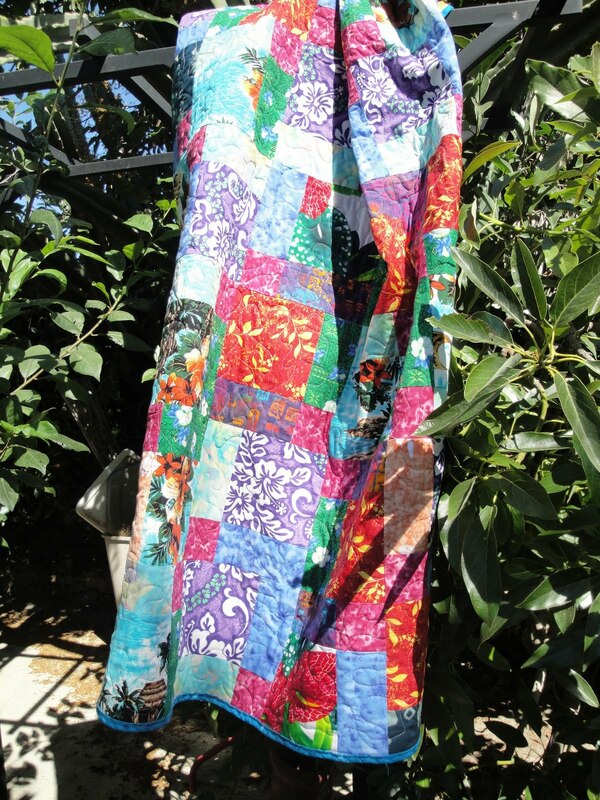 Lyn Brown is teaching at the Two Wacky Women, October 14 - 16, 2011 Quilt Retreat. 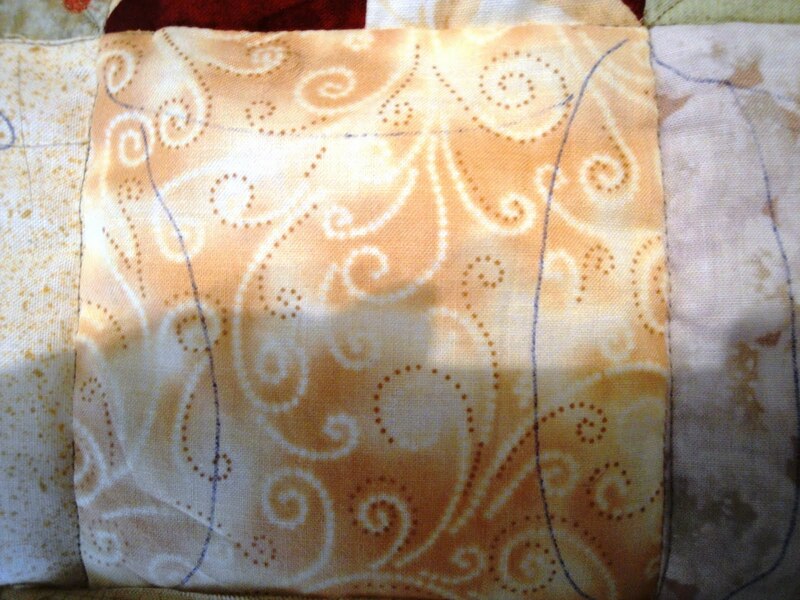 And, she has designed a quilt especially for the retreat. How exciting is that? So, today I have started cutting a few kits. 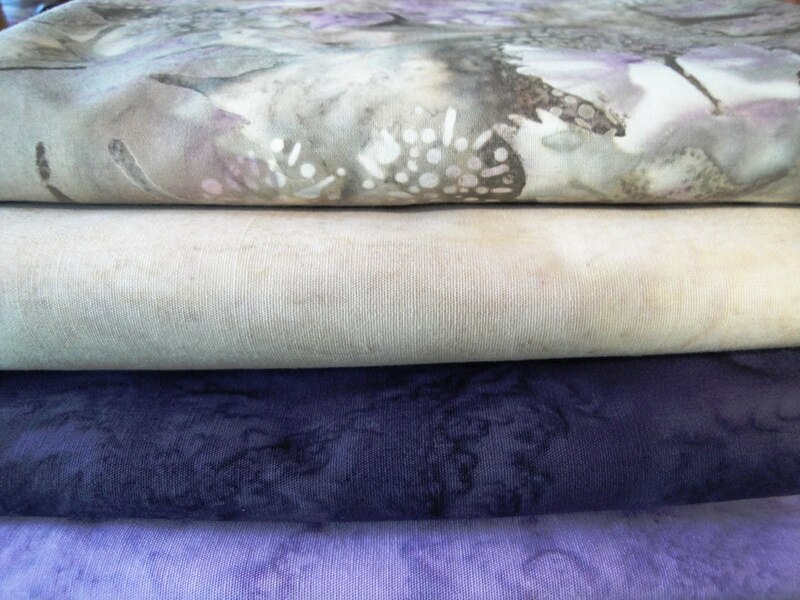 Just look at these yummy Hoffman batiks. 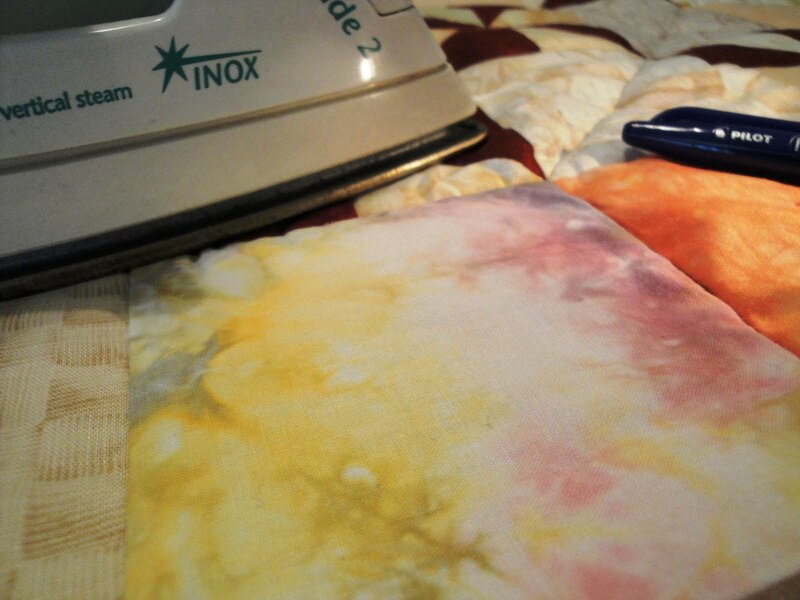 You just know that quilt is going to be gorgeous. And then I started to quilt this Jelly Roll Quilt. Yes, that is super-wide rick rack. 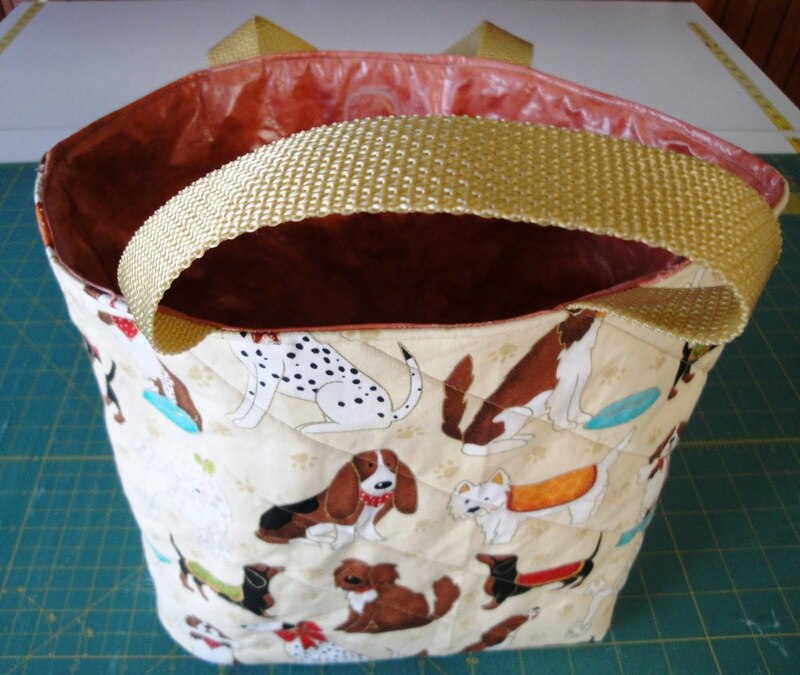 I had mentioned that I was making a new lunch sack. 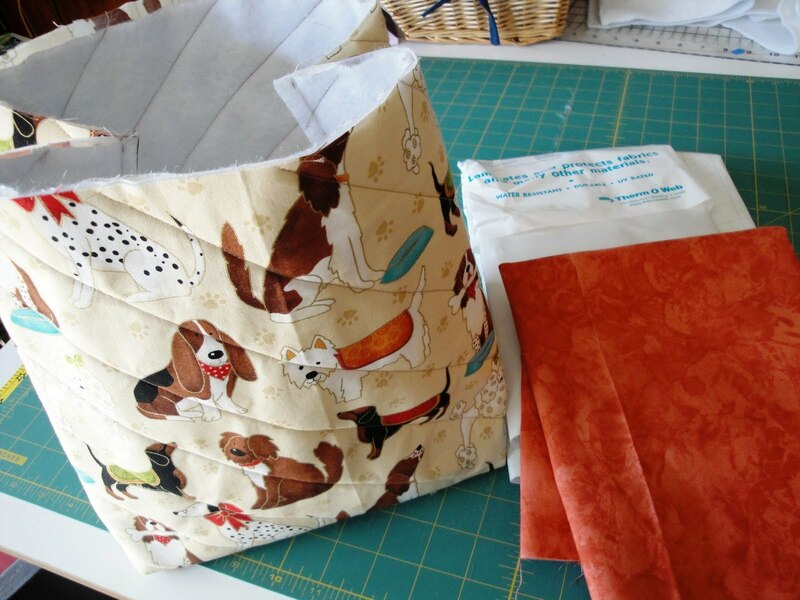 Here it is, kinda: a new, easier-to-make lunch sack. It still needs some tweaking. It is interfaced with Insul Bright. I covered the lining with iron-on vinyl for easier cleaning. It was surprisingly easy to work with. Then I added a magnetic sew-in closer. I'm not in love with the magnetic closure. I think it may work better with a zippered closure. Stay tuned. 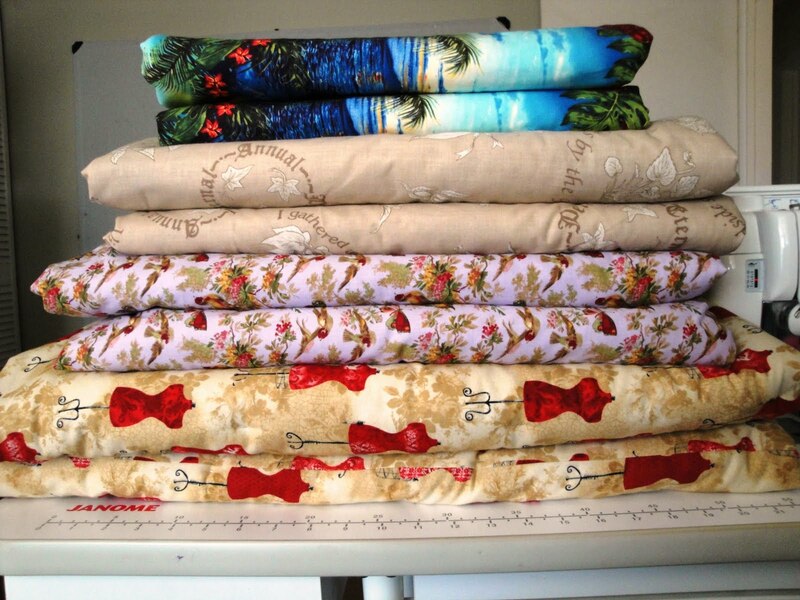 I have been sewing small projects the past few days. 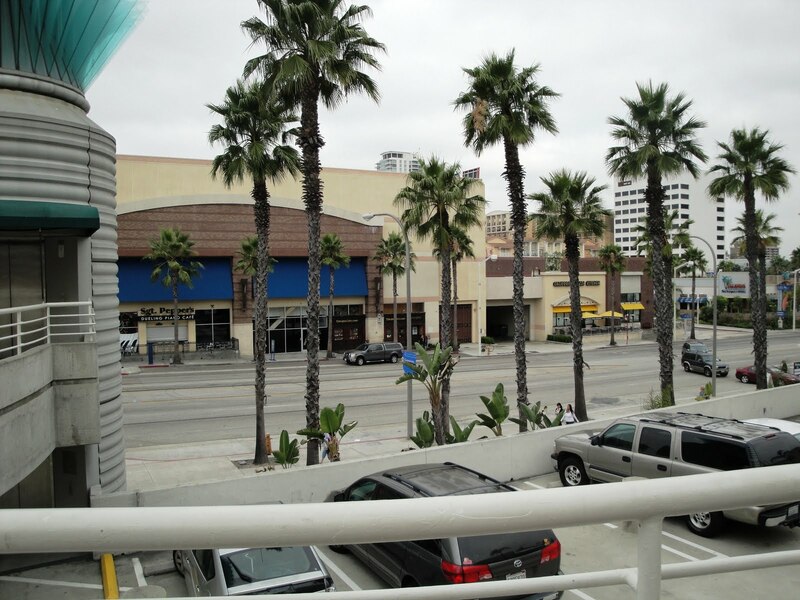 Some I can't show because the recipient may just read this blog. :-) But I can show you these cute lunch sacks I made. The one on the right, with dogs, is for my granddaughter, Madeline. She selected the fabric when she was here visiting. I decided to make myself one at the same time. Now I am working on another one. I decided to create one that will go together a bit faster and add some handles. I should be able to show you the finished bag in a couple of days. Should. This morning while I was out in my garden I noticed a couple of things. This tomato plant for one. I didn't plant this tomato this year. It just didn't die from last year. We rarely, if ever, get a freeze. 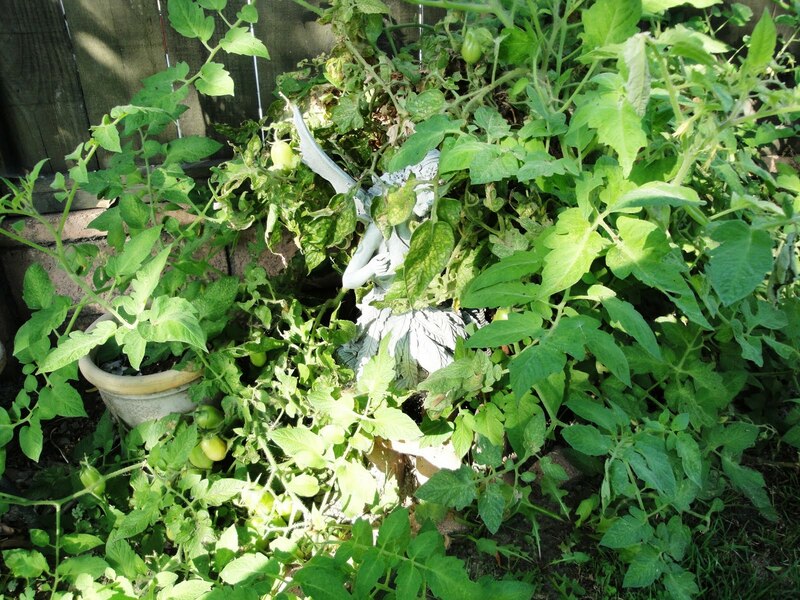 It is actually doing better this year and is loaded with Roma tomatoes. Go figure. 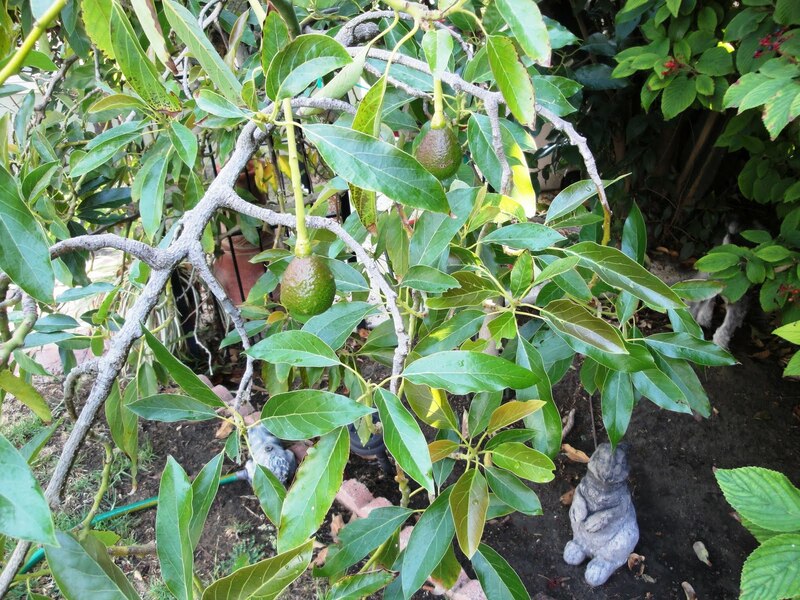 And, this avocado tree was planted when my grandson, Kalani, was born. He's eight now. It isn't ready until December or January. So, the fruit will get much larger. 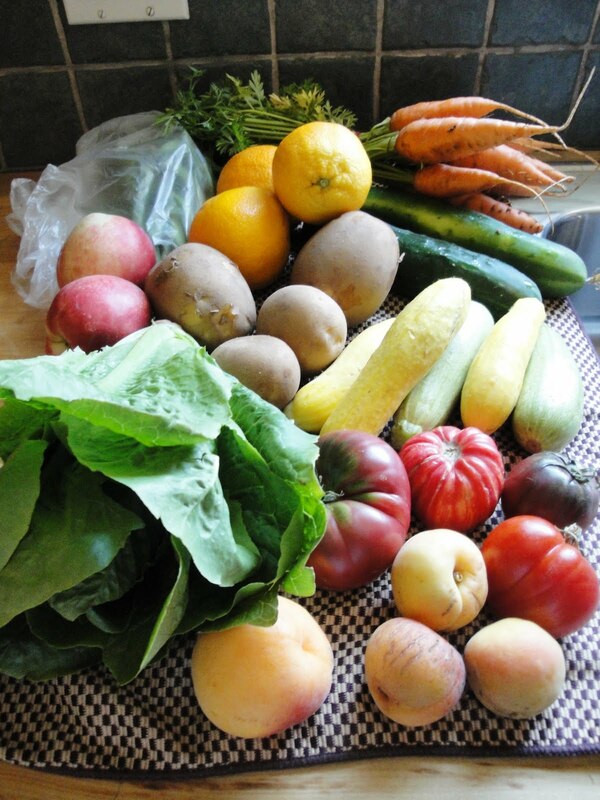 And, this is the Friday when I get my all local, organic Beachgreens delivery. ﻿I do love my Beachgreens. I took advantage of the long weekend and finished the next UFO quilt top on my list. It is just a flimsy at this point. Now to sandwich it, quilt it, bind it, and label it. It is pretty large; but, I am going to man handle it with my Janome 6600. Still thinking about how to quilt it. That is a dark red pinwheel BTW. Now, what to use for the backing? Matchy or some off-the-wall unrelated bright? This UFO of Cindy's isn't due to our guild until the August meeting. But, since I have another one to complete, I can check this off my list. This was the easiest one of Cindy's so far. She had made all the decisions with the exception of the binding. I found it in a bag layered (not pinned) complete with batting and backing. 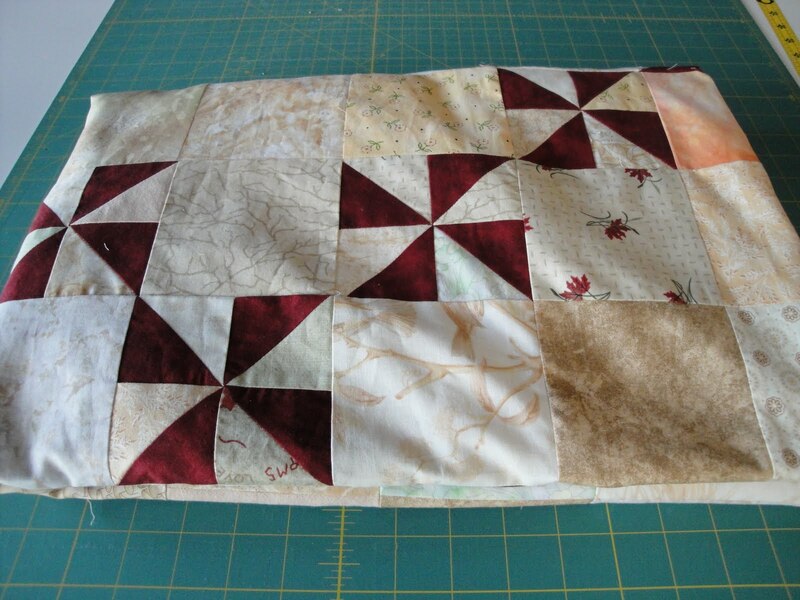 The backing was a surprise from what I had seen of Cindy's projects. But, I love it. All I had to do was pin it, quilt it, and bind it. I had this stripe in my stash that matches the colors. I still need to wash it and put a label on it. This will go to our guild's community service group to donate to charity. 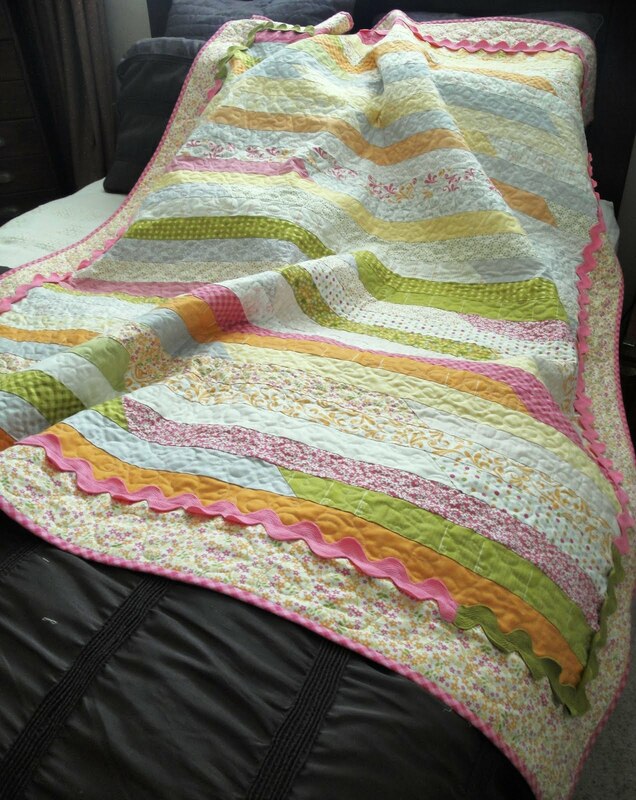 Some new mother will like it for her baby.